Wifely was watching one of her most cherished shows, Jersey Shore. 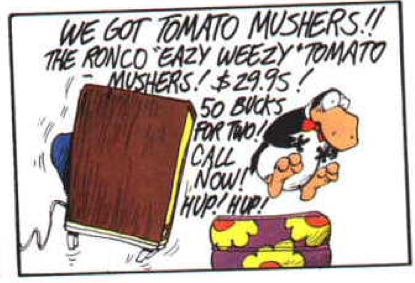 Essentially, Chuck E. Cheese’s for adults. One of my earliest memories of TV is watching, from across the room, a friend and his brother watch it. I remember their hands descending into the popcorn dish, lifting the popcorn to their mouths, their mouths chewing, gazes never leaving the screen, not even when it changed from one show to another, because it didn’t matter to them what they were perceiving. Unlike readers, who actively collaborate with texts to create stories in their minds, these two were passive receptacles of whatever was decided by whomever to be stuffed down their eyeballs. Give me a piece of my preferred mindless entertainment and you will receive a lengthy confabulation justifying its importance. 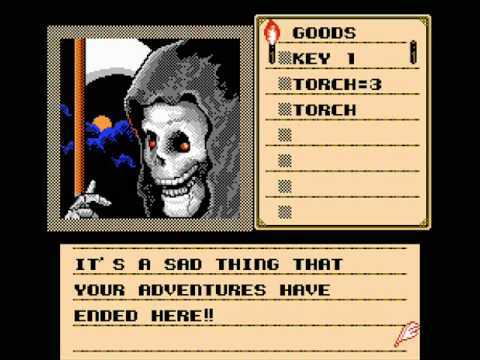 One man’s treasure, yadda. Actually I think it’s the BIG LOUD BASHING NOISE of TV that bothers me, the whole disorderly, sensate chaos of the thing. How the hell is that relaxing? I must be the wrong Myers-Briggs. Somebody pull out the McLuhan and say something wiser, because right now I have to put on some headphones and go write a scholarly article on the hobbies of the Puritans. I HATE TV by Douglas Lucas is licensed under a Creative Commons Attribution-NonCommercial-ShareAlike 3.0 Unported License. Based on a work at www.douglaslucas.com. Permissions beyond the scope of this license may be available at www.douglaslucas.com. Tomorrow I begin a 12-week placement as a clinical teacher within the Fort Worth ISD en route to earning a full-meal-deal schoolteaching certificate. Tonight I’m quite a bit nervous. So I’m confident in my abilities and experience. The anxiety comes from other causes. I’m not at all the best when it comes to crossing t’s and dotting i’s when time is of the essence, and that’s a necessary part of most work. I still don’t have many of the nitty-gritty details figured out (where do I park? ), but I’ve always been able to improvise as a substitute. “Bring it on!” is my basic attitude, but everyone, including me, gets scared. Wifely Kate has been so supportive and generous with her help. This weekend we did a lot of prep stuff, such as buying me more button-down dress shirts, cutting my hair (I still have a big ol’ shock of cowlick-y hair, which seems to be undefeatable). Marrying her has been the best thing that ever happened to me. And not just because she’s cooking breakfast and packing my lunch in the early, early morning as I get my creative writing in before driving to campus. Schoolteaching is also scary because of possible political and work-world implications of online activity, online personal opinions. Working — at least as a substitute — has made me an official public servant. And there’s a lot of controversy over schoolteaching — for example, the Texas textbook controversy. What if something I tweet — such as this in favor of journalist Glenn Greenwald — bothers a parent or a supervisor? Oh well! I don’t really know how to handle that other than how I handle personal interaction in general, which is to try to be honest, fair, and diplomatic. I’m not one to stay quiet and keep my head down. I’m ready. Again: Bring it on. I need to make public something else soon, too, but I’ll leave that as a cliffhanger due to time constraints: I gotta get some sleep! P.S. I blogged this while about 30,000 feet over New Mexico and Texas! 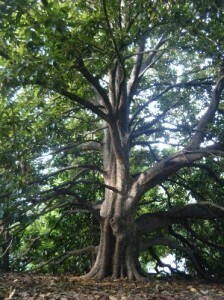 The most impressive Southern Magnolia (Magnolia Grandiflora) in Dallas-Fort Worth lives at the Fort Worth Botanic Garden. 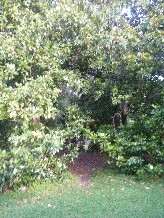 The picture above shows a view of it from near one of the Garden roads (along with a few tiny, other trees). Many magnolias in Fort Worth are impressively tall — for example, the one pictured below, which grows next to the library of my alma mater, TCU — but the one at the Botanic Gardens is the best! 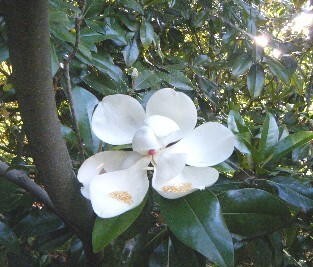 From some angles, the Garden’s huge magnolia can at first look like many trees, not one. That’s why I never(!) truly noticed it; I mistakenly saw a big stand of multiple trees, not a single special individual. This past May, however, Kate — a special individual herself — showed me one of the “secret entrances” to the “cave” made by the magnolia’s drooping branches. Once you go through the secret entrance (no password necessary), you’ll see a scene like something out of Lord of the Rings or a King Arthur tale. This cave hides in plain sight near University Drive, one of the busiest streets in the city! 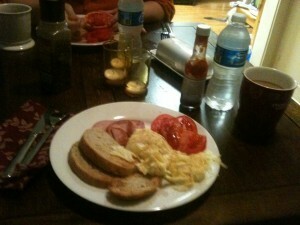 Here’s a shot of it. The branches go all the way around, 360 degrees. 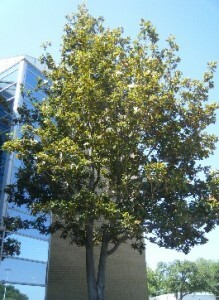 As of 2004, the tree is 64 feet tall. 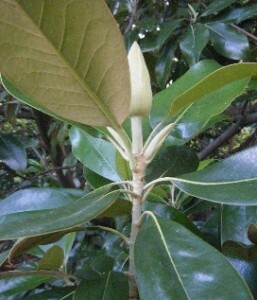 Leaf: Leathery top, fuzzy red-brownish underside, evergreen, alternate simple (whorling at tip), asymmetrical base, pinnately veined, oval-shaped, 5-8 inches long, untoothed margin. 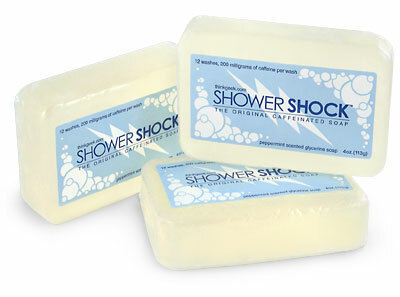 Flower: Large (6-8+ inches wide), creamy white, fragrant. Borne singly, May-June. 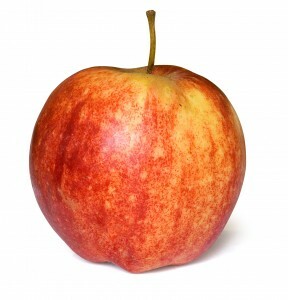 Fruit: Cylindrical aggregate of follicles (“seed pod”). Green changing to red. Matures Oct-Nov.
Twig: Stout. It gives off a citrus scent if broken. Bark: Brown to gray, thin, smooth when young, but plating or scaling later in life. 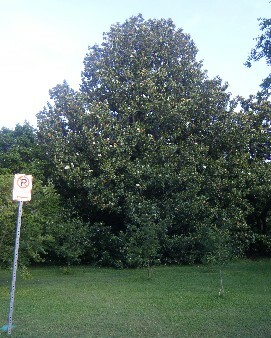 The Southern Magnolia is sometimes called an Evergreen Magnolia, or a Bull-bay. 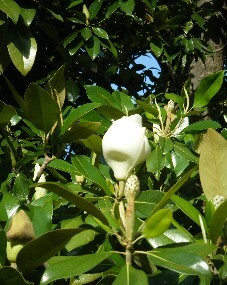 I took four pictures of the tree’s flowers, each illustrating a different stage of the flower life cycle. 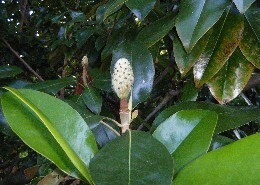 You can learn much more about the magnolia flower life cycle, and see pictures of it, at this website. In the last year I’ve taken to learning about trees via field-guiding. While field-guiding is certainly enjoyable in itself, I started mostly because I wanted to improve my ability to see, both during observation and with my mind’s inner eye. Routine close observation of details — samaras, leafstalks, whatever — definitely has lead to improvement in both areas. For example, a mechanic showed me some small parts of a Civic brake system a few months back. My eyes would have simply glazed over a year ago. But as a result of field-guiding, I could see just what he was talking about. As to the inner eye: I’ve always had difficulty visualizing in my mind. Many people are startled when I confess that while I can close my eyes and picture a stop sign, I can’t mentally change its color. Still can’t. But the more I scrutinize small visual details, the better my mind’s eye becomes. A specific instance of this is what I think of as “stabilizing” my mental imagery. Before field-guiding, if I closed my eyes and visualized the sycamore fruit I have sitting on my shelf, the image would sort of wobble and vanish after only a second or two. Now I can more or less keep it in my inner eye for as long as I can concentrate. 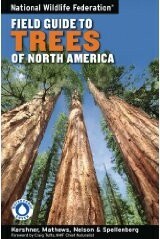 I use the National Wildlife Federation Field Guide to Trees of North America (above). Highly recommended; full of color photographs. I have to say it, I have to conclude with the cheesiest line ever: Enjoy the forest…and the trees!